Waste shell from the extraction of chocolate from cocoa beans for sale. Producers of Hawaiian chocolate made solely from cocoa beans grown on the Big Island. Find products, information on chocolate production, and order online. Chocolate bars made with cocoa beans from Ghana, site includes history and recipes. Manufacturer of and offering vintage chocolate in resealable packaging. Includes recipes,information on stock price, and cocoa history and facts. Chocolate bars made with cocoa beans from Ghana. Includes history, information about Ghana, company profile, process details, online shopping, recipes, and a list of stores that carry the products. Products for body, bath, face, lip and mother and baby care based on cocoa butter. Chocolate gifts, chocolate-of-the-month club, chocolate golf balls in golf set, pink curlers in hairdresser set, or chocolate bait-and-tackle. Chocolate foil coins custom printed or embossed with gold or silver wrapped foil, molded chocolate shapes and imprinted chocolate blocks are available. Over 200 homemade solid chocolate novelties, personalized chocolate gold coins and custom molds. Offering milk chocolate, semi-sweet dark chocolate and white chocolate candies. Chocolate-covered fruit, truffles, gifts, recipes, candy making and bulk chocolate available. Premium chocolate novelties that includes anatomical brains, hearts, ears, feet and also chocolate for all occasions and holidays. For chocolate lovers, a thick hot drinking chocolate made by adding milk. Belgian chocolate gifts, gourmet truffles, sugar free and organic chocolate for holidays, anniversaries and weddings. Chocolate gifts, gourmet truffles, sugar free, and organic chocolate for holidays, anniversaries and weddings. Also gift certificates. A selection of chocolate, gift baskets and pastries. Offering personalized wedding favors. Specializing in chocolate mice and penguins. Custom and personalized chocolate coins, chocolate bars, and confections. Chocolate wedding favors, corporate gifts, custom molds and long stem chocolate roses, hand poured and painted. Offers an array of confectionery gifts for all occasions. Selection includes many of the major chocolate manufacturers complementing Hawaiian made chocolate. Manufacturer of Infused Organic Chocolate, offering a line of 8, 2oz. organic chocolate retail bars and also bulk infused organic chocolate for bakeries or food service. Producers of chocolate and related products. Includes information on growing chocolate in Hawaii, recipes, news, and related resources. Houston store that makes homemade chocolate and chocolate gifts, specializing in unusual molded designs. Gift baskets for all occasions filled with chocolate cookies, chocolate covered pretzels, chocolate truffles, Scottish short bread, coffee. Molded chocolates, almond/pecan bark, tangy fruit, peppermint white chocolate, fudge, chocolate dipped cookies, chocolate/fudge dipped apples. Gifts, custom orders. Blends of tea and cocoa in funky packaging. If the business hours of Cocoa Mill Chocolate Company in may vary on holidays like Valentine’s Day, Washington’s Birthday, St. Patrick’s Day, Easter, Easter eve and Mother’s day. We display standard opening hours and price ranges in our profile site. We recommend to check out cocoamill.com/ for further information. 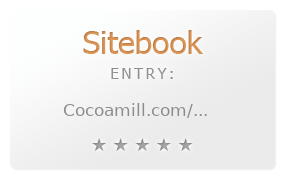 You can also search for Alternatives for cocoamill.com/ on our Review Site Sitebook.org All trademarks are the property of their respective owners. If we should delete this entry, please send us a short E-Mail.